Garlicky lobster-parmesan crostini and lobster-mushroom crostini. Steamed lobster is a roll-up-your-sleeves, don-a-bib, down-and-dirty kind of meal. 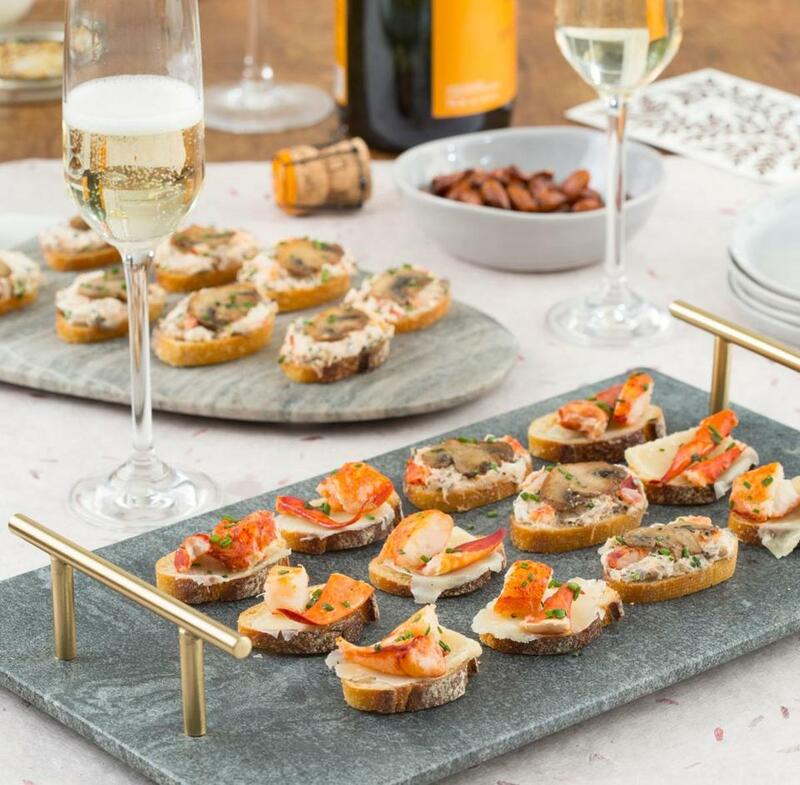 But as you might say when you see a normally scruffy friend in a spiffy suit, lobster “cleans up nice.” Here are three party-worthy lobster crostini appetizers — manageable mouthfuls with great flavors to complement the crustacean, from mushrooms to piquillo peppers to garlic and a touch of Parmesan. Skip the bib and enjoy the party. Both ficelles and baguettes come in different lengths — make sure you buy enough to yield at least 24 neat ½-inch slices. With the rack in the middle position, heat the oven to 400 degrees. 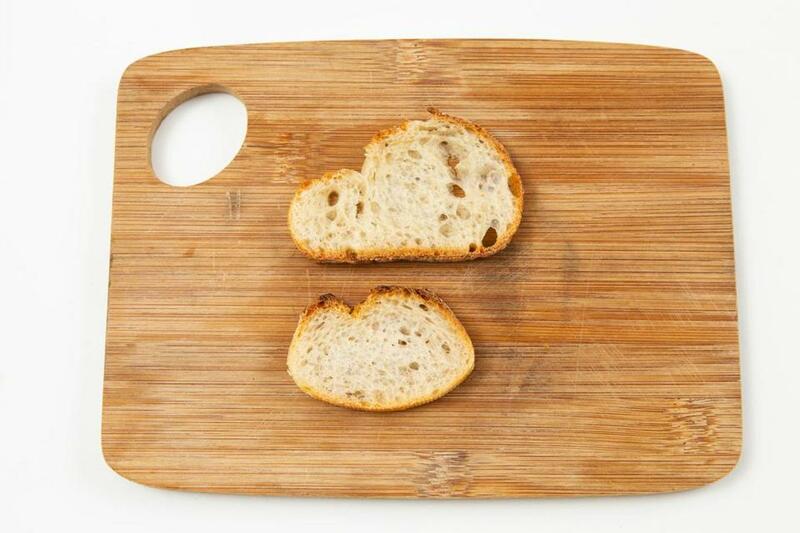 Slice the bread into 3/8- to ½-inch-thick slices, arrange them in single layer on a large rimmed baking sheet, brush with oil if using, and bake until crisp and lightly browned, about 9 to 12 minutes, turning them over halfway through the baking time. Cool and serve (or store in an airtight container for up to a day). If you don’t want to cook and pick your own lobster or pay the hefty price of prepared fresh lobster, try frozen lobster meat. Another option is frozen raw lobster tails to cook yourself (which is much easier and less messy than cooking whole lobsters). In a small nonstick skillet, mix the olive oil and garlic. Set the skillet over medium-low heat and cook, stirring, until the garlic begins to sizzle gently and turns light gold and fragrant, about 5 minutes. Transfer the garlic chips to a plate and half of the garlicky oil to a small bowl, leaving about half the oil in the skillet. Drizzle each crostini with about ½ teaspoon of the reserved garlic oil and sprinkle very lightly with salt and pepper; top each with a Parmesan strip and a couple of the garlic chips. Meanwhile, return the skillet with the remaining garlic oil to medium heat and allow it to warm for a moment. Add the lobster, toss gently to coat with the oil, and cook, mostly undisturbed, to heat through, about 3 minutes, sprinkling very lightly with salt and pepper and turning the lobster pieces halfway through. Working quickly, top each crostini with two pieces of the warm lobster, sprinkle with chives, and serve at once. Many baguettes can measure 3 to 4 inches in diameter, while their skinnier sibling, the ficelle, tends to measure about 2 inches in diameter. I think crostini made with ficelles result in more manageable appetizers, particularly if you’re holding a drink in one hand. Though I usually go for cremini mushrooms over the white button variety, here I prefer the latter because their mild flavor helps the lobster and cognac shine. The topping can be made up to a day ahead and stored tightly covered in the refrigerator. Rest at room temperature for a few minutes before using. Also, you can substitute plain Melba toasts for the crostini. Garnish possibilities include minced chives, a small chunk of lobster (the tips of the claws are nice, if you have some), and sauteed thin mushroom slices. In a medium bowl, toss the lobster, lemon juice, ¼ teaspoon salt, and pepper to taste to combine. Scrape the mixture to one side of the bowl and set aside. Melt 1 tablespoon butter in a medium skillet over medium-high heat. Add the chopped mushrooms and ¼ teaspoon salt and cook, stirring, until mushroom liquid has evaporated and they begin to brown, about 8 minutes (adjust the heat to avoid scorching, if necessary). Clear the center of the skillet, melt the remaining 1 tablespoon of butter in the clearing, add the shallots and cook, stirring, until they begin to soften, about 2½ minutes. Stir the shallots into the mushrooms, add the thyme, and cook, stirring, until fragrant, about 40 seconds longer. Add the cognac and cook to dissipate the alcohol, about 1 minute, scraping the bottom of the pan with a wooden spoon to loosen and dissolve any fond. Scrape the mixture (you should have about 1 cup) into the empty side of the bowl with the lobster and set aside to cool. When the mushroom mixture is cool, add the lemon zest, cream cheese, chives, ¼ teaspoon salt, and pepper to taste and stir to combine well with the lobster and mushrooms (you should have about 2¼ cups). Adjust the seasoning with salt and pepper if necessary. Top each crostini with about 1 generous tablespoon of the lobster-mushroom mixture (spread it right to the edges), and garnish with a mushroom slice, lobster chunk, or sprinkling of chives, if using. Transfer to a serving platter and serve at once. A small strip of piquillo pepper and a sprinkling of minced chives make a pretty red-and-green garnish. 1) Substitute extra-virgin olive oil for the butter. 2) Decrease the quantity of chopped mushrooms to 6 ounces (about 1½ cups) and their cooking time to about 6 minutes. Halfway through the mushroom cooking time, add about 5 roasted jarred piquillo peppers, drained, blotted dry with paper towels, and neatly diced (about ½ cup). 3) Substitute 1 teaspoon pressed or grated garlic (about 1 large clove) and ¾ teaspoon sweet paprika for the thyme.